It starts innocently. Just a jog around the track at the local YMCA to finish up a workout. A cool down, if you will. I round the first curve and bam, everything changes. There’s another runner maybe 20 yards ahead. Obviously I have no choice but to speed up and pass her. Just like that, my easy/steady/jog/recovery pace is done. Gone. Shattered. I’ve transitioned to race mode in under 10 seconds. I pass the first runner in front of me and am flooded with endorphins. Oh yeah. Look at me. So fast. So cool. I deserve a medal. Never-mind the fact that the person I just passed is approximately 40 years older than me. [Go Granny.] I still get the unreasonable sense of pride by being “The Faster One”. Everything is dandy for about 10 more seconds. Then, all of the sudden, out of nowhere, what is THIS?!?!? Somebody ELSE is passing me?!?! Oh my ego. My poor ego. As I attempt to pick up my broken pride while still running fast enough to stay ahead of Granny, I realize I have no choice but to catch up to the hot-shot that just blew past me. I’m also a little bit angry because I feel like I’m somehow losing this circular race now. So I pick up the pace, again. I. Must. Win. It takes about half a lap for me to catch up to this hot shot. I swear he keeps speeding up. My race-mode transitions to sprint-mode. The self-dialogue going on inside my head is ridiculous nonsensical mix of competitive catch phrases and the worst curse words I can think of. (Isn’t the connection between “bad” language and adrenaline intriguing?) Finally, I give it one last push and FLYYYYY past him, continue around the next curve, and then get off the track immediately because I realize I will puke and probably die of a heart attack if I run another step. Well that was a good cool down. Given the combo of my relatively slow pace as a runner and the weird intensity my face gets when I’m legitimately pushing myself (see picture above for reference), I fully acknowledge how amazingly ridiculous this must look. All can hope is that it provides some sort of entertainment to those poor souls slogging away on the elliptical machines lining the track. The Alissa Jean Max Group Velocity Running Track Theory (AJMGVRTT) – If you fill a running track with several competitive runners, the runners will automatically compete with and try to pass eachother, thus continuing to raise the overall speed of all competitive runners on the track until maximum group velocity of the track is reached. 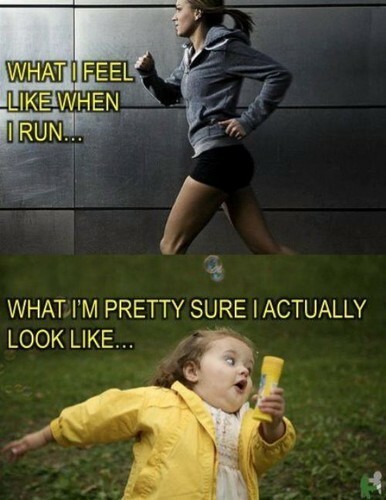 That is, when somebody has to stop running because they will literally puke or die if they continue to run.